Home / The Archives / Xootr, Nick. Nick, Xootr. Now play nice. So, as some of you may know, I have been sent the Xootr Swift to do with what I will. Since, much to the chagrin of Jay, I have come to love riding fixed-gear and have forsaken the freewheel, I decided to turn this great little folding bike into a great little folding fixed-gear bike. What this will mean: First, a new hub. The Xootr has a 52mm chainline (distance from the front chainring to the center of the frame), so I can’t just throw any old track hub on the bike, at least not if I want to use a flip-flop hub, with a fixed gear on one side and a freewheel on the other, so that friends can use it too. I need a hub with a 52mm chainline, laced to a 20-inch wheel. I’ve handed this task to Tony at IRO Cycles, who had the necessary hub in his truck. That alone is the only necessary change. Everything else: pure style, and I’m still debating my options. Derailleur, shifter, padded saddle and stock grips are definitely out. I might go with a pair of straight handlebars, or I might go with bullhorns. Definitely a smaller saddle. I will probably remove the rear brake, but then again, maybe not, especially if I’m using it as a guest bike. I’ll be back with an update when I get the rear wheel. And, in case any of you were curious, it’s pronounced “zoo-ter.” I didn’t know that either. Hey Nick, it looks like a fixed gear conversion has been done on the Swift before. Check out http://www.xootr.com/xootr/swift/gallery.shtml and take a look at the black Swift. Yep, I saw that! Wish they had larger pictures. The wide chainline makes things harder, but with those horizontal dropouts, it’s just begging to be converted. Part of me wished I had the black model, but hey, maybe I can use a little more color in my life. This transformation will be neat, but it’s not very likely that most people who might consider buying one of these will want to do this. 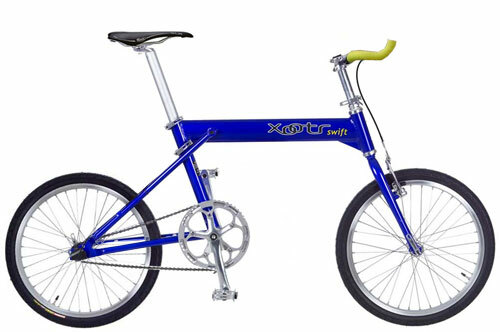 So how about giving us a review of the stock xootr before you Frankenbike it. Moe did a revie won the stock Xootr a while back. Check it out. I think Moe’s review covered a lot of ground. Plus, the bike’s main feature — the ability to fold up — is no different as a fixed gear than as an eight-speed. The Xootr Swift doesn’t have a lot of specialized components, so it’s very easy to customize. I think that’s a big selling point for a bike like this. Not all folders out there are this easy to customize, so since Moe has said all that can be said about the bike itself, I’ll see how it stands up to my specific needs. That way, I can say more about the bike than that the seat is too cushy, the handlebars too high, and that it has too many gears. Okay. Frankenbike away. But I want to see photos of this thing on the street. All I’ve done so far is shorten the stem post a few inches, but I’ll take a photo of myself on the bike next chance I get.